After high school in Moscow, Idaho, "I left as soon as I could," says Maggie Minnich, who moved to Eugene in 2007 to enroll in pre-journalism at the UO. 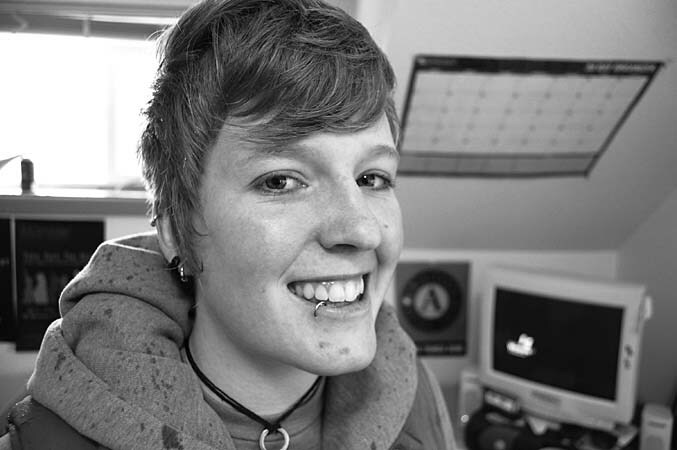 During that school year, she also worked on the Assault Prevention Show at the ASUO Women's Center. "I met a lot of people who were passionate about prevention of sexual violence," she says. As she had already planned to take a year off from school to work and to establish residency in Oregon, Minnich applied for a position at Sexual Assault Support Services (SASS) through the state's AmeriCorps HOPE (Healthy Options through Prevention and Education) program. "I do youth prevention education," she says. "Teachers call us to give presentations in middle schools and high schools. I love talking with people, especially youth." Minnich helped coordinate last month's Take Back the Night rally and march, and she has developed a curriculum for a proposed teen volunteer program at SASS. When her Americorps contract ends in July, she plans to apply to the UO's degree program in Family and Human Services. "After this year at SASS, I've become more interested in social services," she says. "I'd like to work with youth in the sexual-health field."